issued in 5 July, 2008. 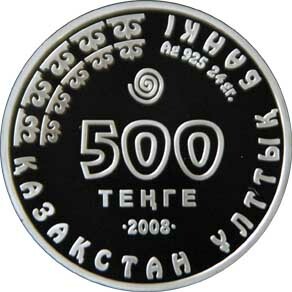 On the face side of the coin in the center the legend “500 TENGE” is located in two rows indicating the face value of the coin. 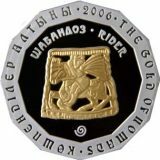 Under it the figure “2008” indicates the year of coinage. Above figures it is a heraldic representation of a spiral. 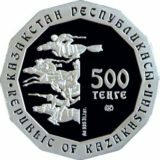 Along the circumference the legend of issuing bank in Kazakh language means issuing authority. 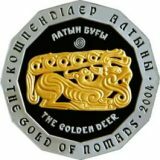 On the upper left part of the coin, in two lines of circumference there are elements of traditional ornament, on the right side – a circle inscription “Ag 925. 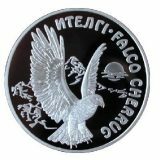 24gr.”, indicating the production metal, its standard and weight. On the back side of the coin, on its central part there is an image of a Tien Shan Brown Bear against a background of forest bush. 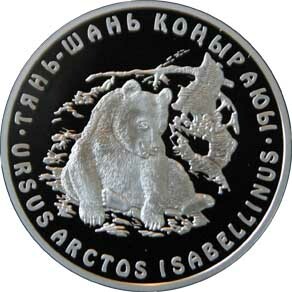 On the circumference there is the legend with the name of the coin “URSUS ARCTOS ISABELLINUS” in Kazakh and Latin – the name of the bear.